Wasps director of rugby Dai Young has been told that Wales full-back Leigh Halfpenny will not be playing in the Premiership for them next season. The Ricoh Arena had been earmarked as an option for the injured 27-year-old British & Irish Lions star when his contract at Toulon expires this summer. "He was always a bit of a long shot," Young told BBC Coventry & Warwickshire. "He's certainly not pursuing Wasps as one of the options he wants to take forward." Young, a former Wales and British & Irish Lions prop, continued: "It's part and parcel of the professional game. There were one or two other options that he's got. "We just wanted to be in the mix if he decides to come to the Premiership, but we've been led to believe that he's pretty much decided not to take up an offer from the Premiership, which would be us." Halfpenny, who has been with French side Toulon since 2014, has not played this season after suffering an anterior cruciate ligament injury to his right knee in a World Cup warm-up game for Wales in September which forced him to miss the competition. He is expected to miss this year's Six Nations Championship, having had to undergo reconstructive surgery. His former side Cardiff Blues want him back, while Scarlets have said that they would be keen to take him back to Wales. Halfpenny has the option of another season in Toulon and looks increasingly likely to trigger that clause in his contract. Wasps, ninth in the Premiership, having won just three of their eight games this season, currently have Rob Miller at full-back. Swansea-born Halfpenny has so far amassed 508 points in 62 Wales internationals, making him the their third highest all-time scorer, behind Neil Jenkins (1,049) and Stephen Jones (917). He was player of the series on the British and Irish Lions' victorious tour of Australia in 2013, breaking the records for most points in a series (41, held by Jenkins) and in one Test (19). 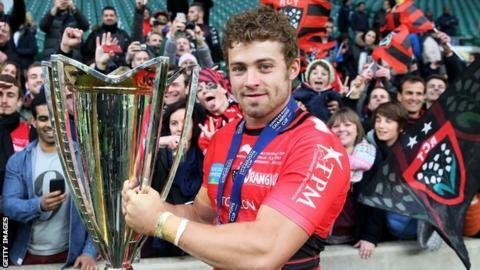 Halfpenny is just 38 short of 1,000 points in his collective club rugby career for Cardiff, Cardiff Blues and Toulon.